9540 Shore Drive #2D-Ocean Side Second floor unit, close to golf, restaurants, night life and fishing. Balcony view of Ocean. Located right beside Sands Ocean Club with balcony view of Ocean Annie's Beach Bar. Recently remodeled and furnished. The Shore Drive area is located between North Myrtle Beach, and the Myrtle Beach, putting it in the ideal location for convenient access either area. You are close to most all attractions, within 4 miles from Barefoot Landing, which has over 100 shops and entertainment, like The House of Blues, Alabama Theater ,and many great restaurants. 2001, one of the best nightlife clubs in the area 1 mile away. The new Broadway at the Beach, is within 7 miles, with shopping, Ripley's Aquarium, and restaurants. Among them, Hard Rock Café, Nascar Café, Planet Hollywood and Key West Bar and Grill. Close to many of the 100 golf courses in the Myrtle Beach area. Living Room view of #2D. Equipped with VCR, Cable color TV, and queen size sofa sleeper. Balcony services living room and master bedroom with outdoor patio furniture and a breath taking ocean view. #2D-Newly updated kitchen with all new appliances, including microwave, dishwasher, disposal, as well as water softening filter ,coffee pot ,and radio with stereo CD player. 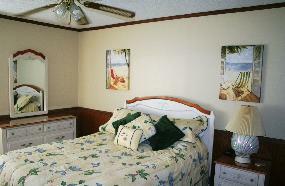 #2D Master bedroom with queen size bed, ceiling fan, ceramic tiled bathroom and TV. Balcony for relaxing with ocean view. 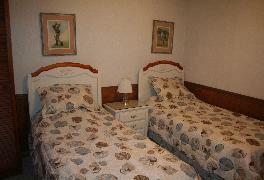 #2D Second bedroom with twin beds, ceiling fan and full size closet.